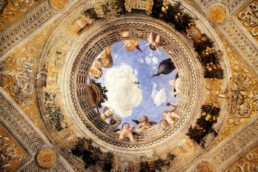 The theatre was designed in 1588 by architect Vincenzo Scamozzi for Vespasiano Gonzaga Colonna, Duke of Sabbioneta. The innovative entrance system, the mixed profile of the cavea, and the changing rooms for actors and orchestra players at the back of the stage, puts it among the most prominent examples among European theatres. The elegant decorative structure of the main hall is suspended between a re-visitation of Vespasiano’s favourite classical myths and the current taste of the painted balustrade on the upper tier of the room, displaying musicians, comedians, dames and knights in late XV century attire. Sabbioneta was founded by will of Vespasiano Gonzaga Colonna (ab urbe condita, 1556 – 1591), a condottiere, enlightened and cultivated prince and a scholar of Vitruvius. It was the capital city of the tiny Gonzaga duchy: well protected by the ramparts of the strong, star-shaped walls whose project is attributed to Vespasiano himself, Sabbioneta was also a modern hub for art and culture, a sort of “small Athens”. The walls still guard the checkerboard urban structure as well as the sophisticated XVI century buildings. Among the most interesting parts, the gateways called Imperiale and della Vittoria, the Galleria degli Antichi, the Theatre, the Palazzo Ducale – the first major building ever built in Vespasiano’s new city – and the archpriest church of Santa Maria Assunta. Other noteworthy landmarks are the “Casino” or Palazzo Giardino, the duke’s otium sanctuary, the Colonna della dea Pallade, a statue of Adrian or Anton age purchased on the antiquity market by Vespasiano; the church of Incoronata, a Ducal mausoleum where in the summer of 1988 the restoration works unveiled the tomb of Vespasiano Gonzaga. Mantua’s Palazzo Ducale, between piazza Sordello and Lungolago dei Gonzaga, is one of the most articulate, layered and, in spite of having been dramatically plundered at times, extraordinary examples of western hemisphere art and history. The connections among its various elements – streets, squares, courts, gardens, bridges, overpasses and underpasses commissioned in the mid XVI century by Duke Guglielmo – make this monumental complex a city within the city, and the sumptuous and celebrated seat of the prestigious Signoria for centuries; a place always abreast of art avant-gardes, so much that many of its corners can be considered true manifestos of European cultural art between the XV and the XVII century. 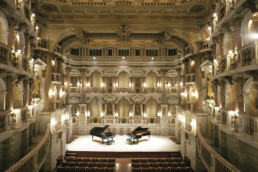 Sala Maffeiana is part of the original layout of Teatro Filarmonico dating back to the middle of the XVIII century. 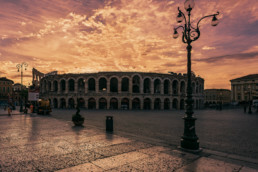 The main opera house of Verona has ben owned since its inception by Accademia Filarmonica di Verona, a cultural institute founded in 1543. Bologna painter Filippo Maccari made the frescoes in the main hall. A very young Wolfgang Amadeus Mozart performed here in 1770. Basilica di san Zeno and the adjacent Abbey tower and bell tower, form one of the most outstanding Romanic-style complexes in northern Italy. The façade stands out for the large rose window and the famous porch supported by two lions, sculpted towards the end of the XII century. 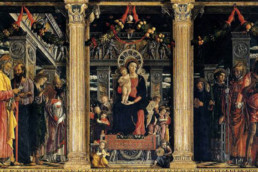 The inside of the basilica is no less majestic with three large naves, a crypt, several frescoes and as a final treat, a table by Mantegna portraying ‘Mary on a throne with the Baby and the Saints’, a masterpiece of mid-XV century Italian art and a milestone of Italian art history.